Not from Kilkenny or Tipperary and want to know what tonight in Nowlan Park really means? Consider the following tale. Barrie Henriques – commentator, columnist, ex-publican, raconteur and all-round renaissance man – was at home in Callan the morning after last year’s All-Ireland semi-final when the phone rang. The caller was a Tipperary man, also living in the town. He sounded down in the dumps and he had a request for Senor Henriques. There you go. There may be blood tonight, there may be timber but there’ll most certainly be boasting and bragging and slagging afterwards. Not just for the night, not just for the week, but for the autumn and the winter too. Oh to be a publican in Kilkenny tonight if the visitors win; the Tipp fans won’t go home. And when they do, some of them will go 30 miles out of their way to stop off in Callan and Urlingford en route. This newspaper recently deemed Cork/Kerry to be the most enduring rivalry in Gaelic games. That was fair enough, but here’s the asterisk: Cork/Kerry is less visceral, less rooted in the communal marrow, because only one of those counties is obsessed with football. 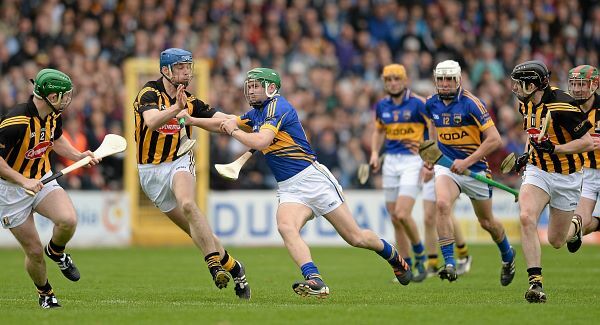 With Kilkenny/Tipp, both counties are obsessed with hurling and then some. It is the Old Firm derby without the religion, the Buenos Aires derby without the sunshine, the Rome derby without the flick knives. Someone will some day write a fascinating thesis about the rivalry, its basis and its twists over time. Till then, ponder this. Kilkenny/Tipp endures and bubbles not because the pair are so wildly different but because they’re so absurdly similar. Neighbouring counties, both racy of the soil. Horses. Greyhounds. Smithwicks and Bulmers. They’d actually like one another if they ever dared allowed themselves to. Part of the reason for the great send-off Pa Dillon received in Freshford a few weeks back was the battalion of former Tipp hurlers, ancient foes from the 1960s, who turned up (and were welcomed with open arms). In the here and now there can be no room for such sentiments. You may have seen that poster hanging in Gortnahoe: a blue and gold hammer nailing down a black and amber coffin. What better way for this Tipperary generation to banish the nightmare of last August, and atone for sundry other sins, than to kill off Kilkenny’s greatest-ever team and tramp the dirt down? Or think of the man from Graigue-Ballycallan, another of those places on the front line – Ballingarry starts on the far side of the bridge, just after James Ryall’s home place – who announced during the week that he was considering backing Tipp. Kilkenny have painted it black and amber like no decade was ever painted before, but how long more can they keep a grip on the rope? Don’t get hung up on tonight’s outcome. The Shefflin/Delaney/Walsh nexus is, inevitably, not much longer for this world. Its passing, rather than anything that happens here in Nowlan Park, will mark the end of the greatest era for any county in the history of hurlingkind. Till then Kilkenny, wounded zombies, remain on their feet and lumber onwards. Just about. In their 10 league and championship outings this year they’ve broken the 20-point barrier only three times. In their three championship outings to date they’ve created only one goalscoring opportunity. The problem isn’t so much the injured absentees as the injured participants. Eoin Larkin, plagued by shoulder and groin problems, started all 10 games and has a total of 0-5 from play to show for it. Michael Rice, out injured from August to late March, has been substituted in all three championship matches. TJ Reid was out injured from the last Sunday of September to the second Sunday of June. Richie Power has been playing through broken ribs. Joint favourites at 5/2 for the All-Ireland? Which will take them another five games to win? Full disclosure. Up to Thursday this observer was giving Kilkenny no chance. Then Tipp named a team that contained 14 players who appeared in the 2010 final and 12 who started last August. It is too many on each count. Devolution rather than evolution. Both tonight’s XVs look leaden and careworn. Eamon O’Shea had the chance to select a younger forward line that might run the hosts ragged — and didn’t. The best-case scenario for him involves winning it off the bench and discovering his optimum attacking sextet in the process. In view of their superior match fitness Kilkenny should start the better. And must; they won’t win this coming from behind, not unless they spring Shefflin and he performs a re-enactment of the wedding feast at Cana. In contrast, Tipp if they start well could win it from pillar to post. Get the knife in early and keep twisting it. Build up a lead and if it comes to it they could even – shades of the league final — insert a third man in midfield to make assurance doubly sure. It’s been largely forgotten that Tipp had the goal chances to be out of sight long before their last-quarter collapse against Limerick. The longer they remain in the championship, the more comfortable they’ll get with the precision forward game O’Shea wants. As ever, much will pivot on Bonner Maher’s first touch and his ability to get the sliotar into his hand and go to war. But the champions have nobody to pull the strings as subtly as Noel McGrath will for the visitors, and Michael Fennelly’s absence will help Padraic Maher operate more off the front foot. Still, will it matter either way? Far from being The All-Ireland final in July, as lazily touted in some quarters, tonight may be nothing more than a neighbours’ squabble to see who gets chinned by Waterford next week. The reason the losers here will bow out is that they didn’t deserve to go any further.